Lyme disease is caused by a bacteria found in some deer ticks. An infected tick passes Lyme disease to humans through its bite. If untreated, the bacteria can pass into the blood. The blood will carry it through the body. The bacteria may then settle in various body tissue. The spread of the infection can cause a number of symptoms, ranging from mild to severe. Kaposi’s sarcoma (KS) is a form of cancer. It affects the blood vessels. 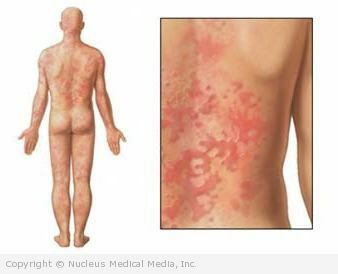 It can cause lesions on the skin, mucus membranes, or internal organs. It occurs most commonly in the gastrointestinal tract and lungs. Impetigo is a skin infection. It often appear as blisters around the mouth and nose but it can infect skin anywhere on the body. 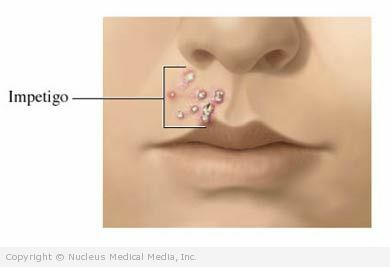 Impetigo can easily spread from one person to another. This infection occurs most often in children. Inherited ichthyosis is caused by a genetic defect that is passed from parent to child or that occurs spontaneously. Hives are small, itchy, red swellings on the skin. The swelling occurs singularly or in clusters. Hives tend to fade after a few hours, but new ones can appear. Most cases go away within a few days. But some last a few weeks or longer.